No, this post is not a tribute to the late cowboy star Roy Rogers, even though I did have a Roy Rogers and Dale Evans lunchbox back in the fifties. 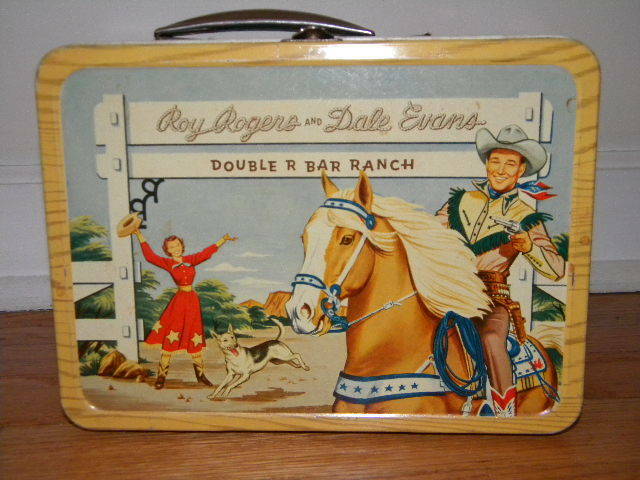 I certainly wouldn't be using such a lunchbox today, however, considering that Roy Rogers had the audacity and poor taste to have his faithful horse Trigger stuffed and mounted and displayed in a museum. At least Roy was considerate enough to wait until Trigger had passed on to Horse Heaven to undertake the mounting and stuffing. No, this note is rather to acknowledge that I'll be on hiatus from Nouveau Old, Formerly Cute for a little while. It's not that the muse has left me, but she has asked to be traded. (Bada-Bing!) When I line up my new muse, I'm going to be shooting for Sharon Stone. Here's hoping I don't wind up with Sly Stone. There's lots of people I'd like to thank for their support with the blog, but I'll save that for another time. There is one person specifically who gets a gold star. That's my friend Russell Gayer - a terrific humor writer in his own right - who has been consistently supportive of my writing and has commented on almost every post. Occasionally even positively. I'll be back. In the meantime, if you want to write to me for any reason you can always reach me through Facebook or at perry.block1@gmail.com. And I'll still be posting on Facebook and Twitter. And as Roy Rogers would say, Happy Trails ...​. Bullet "The Wonder Dog" also fell victim to Roy's taxidermy fetish. Fortunately, Dale outlived Roy or she would have probably stuffed her too. Don't stay gone too long. I can't hold down the humor fort by myself for more than a month. Take a laxative. Maybe then you can pass this Hiatus thing. I'll be back in a bit as soon as I figure out how to make the humor fort less like the humor Alamo. In the meantime, in between time, I'll try to age gracefully, and you do the same. Oh, that's right, you wanted to play "ride 'em Cowboy" with Florence Henderson. No wonder you're feeling so down.